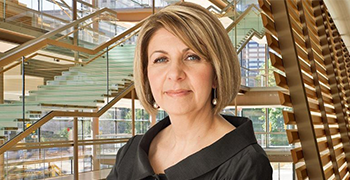 Western Engineering is extremely proud to announce that Catherine Karakatsanis, BESc'83, MESc'91, is the 2019 recipient of the Engineers Canada Gold Medal Award, to recognize her profound contributions to the profession and her community. Engineers Canada recently revealed the recipients of this year’s Engineers Canada Awards, to be honoured during a ceremony held on Thursday, May 23, 2019, at the Fairmont Château Frontenac in Quebec City, Quebec. Engineers Canada is the national association of Canada’s engineering regulatory bodies. The award program presents nine awards annually in celebration of outstanding Canadian engineers. Karakatsanis, Chief Operating Officer and Director at Morrison Hershfield Group Inc., currently sits on Western’s Board of Governors and is the previous Chair of Western Engineering’s Advisory Council. Karakatsanis now adds another honour to her long list of accolades, which includes past recipient of the Professional Engineers of Ontario Gold Medal in 2017, the 2008 recipient of the L.S. Lauchland Engineering Alumni Medal, and in 2016, she was inducted into the Women’s Executive Network’s Hall of Fame for Canada’s Top 100 Most Powerful Women. To learn more about the 2019 Engineers Canada Awards, visit engineerscanada.ca.